Douglas designed and built the DC-1 airliner in response to a specification issued by TWA airlines. 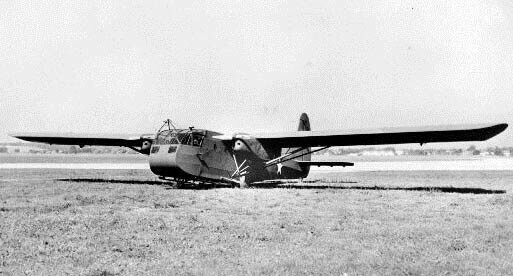 The sole example first flew in 1933, and was soon followed by the larger and more powerful DC-2. This aircraft showed that air travel could be comfortable, safe, reliable and fast and 156 were built. 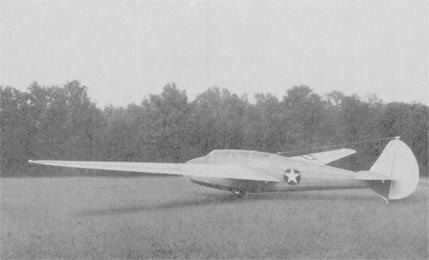 In 1935 Douglas produced an enlarged DC-2 named the DC-3, which became one of the most successful aircraft of all time. Members of the family were built in greater numbers than any piston engined transport before or since. 10,655 of all models were built between 1936 and 1945, of which 10,048 were military variants. Another 4937 were built under licence in Russia as the Li-2 and 487 in Japan as the L2D. 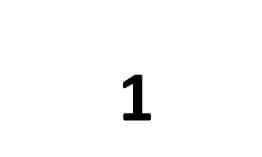 A large number of designations were applied to military variants depending on engines, equipment and role. The most common were the C-47 cargo transport and the C-53 dedicated troop transport. War surplus C-47’s formed the backbone of post-WW2 regional civil aviation services and large numbers remained in service for many years. Examples remained in US military service until well into the 1970’s, including service in Vietnam as a gunship. 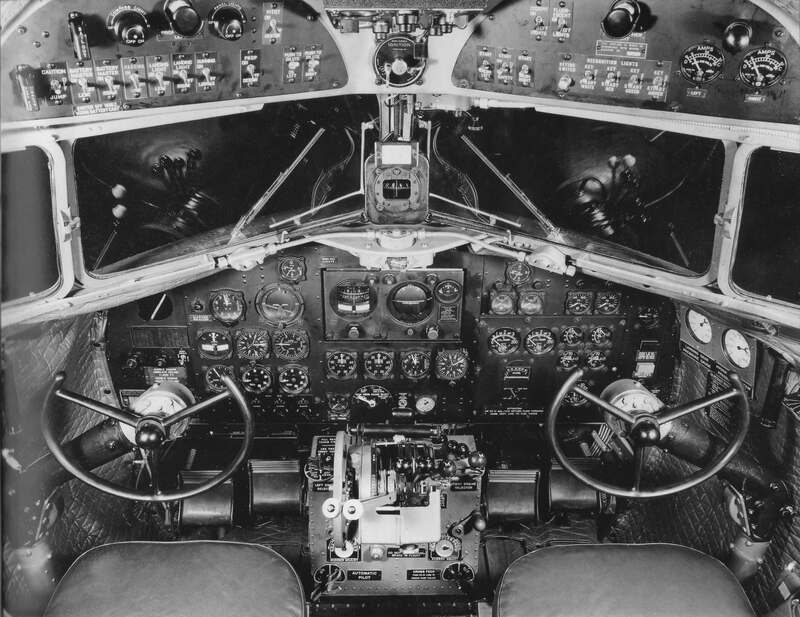 We offer six titles covering most military and civil variants of the DC-2 and DC-3. Each title costs US$9.95. The files have been scanned from the original flight manuals and retain any colour pages, unless otherwise stated. Handbook of Flight Operating Instructions for the USAF models C-47, C-47A and Navy models R4D-1, R4D-5, AN 01-40NC-1 dated 20-11-44 revised to 2-11-51, with approx 104 pages. Handbook of Flight Operating Instructions for the USAF models C-47B, C-47D and Navy models R4D-6, R4D-7, AN 01-40ND-1 dated 19-9-45 revised to 12-10-51, with approx 66 pages. USAAF Pilot Training Manual for the C-47 Skytrain, undated with approx 111 pages. Handbook of Operating and Flight Instructions for the USAAF models C-39 and C-42 Transport aircraft, Technical Order No 01-40NB-1 dated 25-3-41, with approx 33 pages. 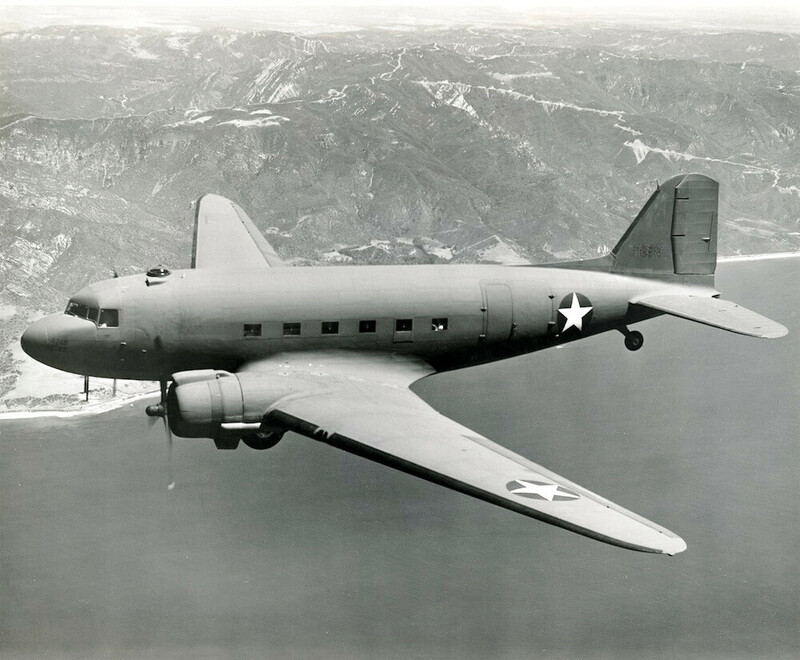 The C-39 was a combination of DC-2 fuselage with the DC-3 wing, while the C-42 was a VIP version of the C-39. 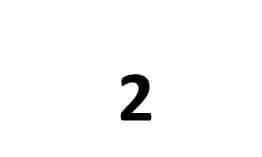 USAAF Pilot’s Flight Operating Instructions for the “DC-3”, Technical Order No 01-40NL-1 dated 30-4-42 revised to 5-5-43, with approx 86 pages. Unusually, this USAAF publication uses a civil model designation. Inside, the manual lists all those USAAF models the manual applies to, from the C-38 through to the C-53C. (These are all civil DC-3 aircraft impressed into USAAF service during WW2). USAAF Maintenance Instructions for the “DC-3”, Technical Order No 01-40NL-2 dated 15-5-42 revised to 5-5-43, with approx 415 pages. This is the companion manual to the flight manual above. Flight Operating Instructions for the C-47 and C-47A, AN 01-40NC-1 dated 10-3-43, in the Russian language. (Basically a Russian translation of the USAAF manual). RAAF Pilot’s Notes for the C-47B (also applicable to the C-47A), RAAF Publication No 821 undated, with approx 65 pages. Canadian Forces Aircraft Operating Instructions for the Dakota, EO 05-35A-1 dated 3-8-71, with approx 132 pages. RAF Pilot’s Notes for the Dakota I and III, AP 2445A & C-PN Edition dated Feb 44 with approx 40 pages. RAF Pilot’s Notes for the Dakota IV, AP 2445D-PN 3rd Edition dated Apr 49 with approx 52 pages. USAAF Handbook of Operating Instructions for the C-53, Technical Order No 01-40NJ-1 dated 20-4-42 revised to 10-8-42, with approx 99 pages. 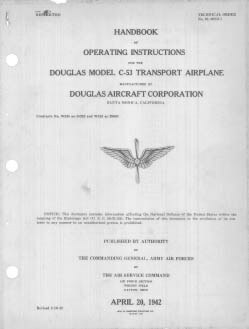 Manufacturer’s Operating Instructions for the Douglas DC-3, dated 1942, with approx 113 pages. 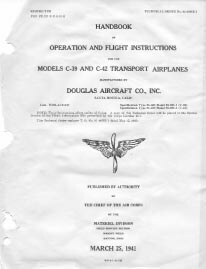 Manufacturer’s Operation Manual for the Douglas DC-3C, dated 1-12-46 revised to 1-6-47, with approx 68 pages. Manufacturers Maintenance Manual for the Douglas DC-3C, dated 1-7-46 revised to 1-6-47, with approx 528 pages. Flight Manual for the USAF models C-47A,B,D C-117A,B,C, US Navy models C-47H, C-47J and TC-47K, NAVAIR 01-40NC-1 and TO 1C-47-1 dated 15-3-66 revised to 1-7-66, with approx 356 pages.